Not only appeared as a VIP, Miss H’Hen Nie also took to the streets and cheered, visiting quite enthusiastic with the crabs participating in the tournament. 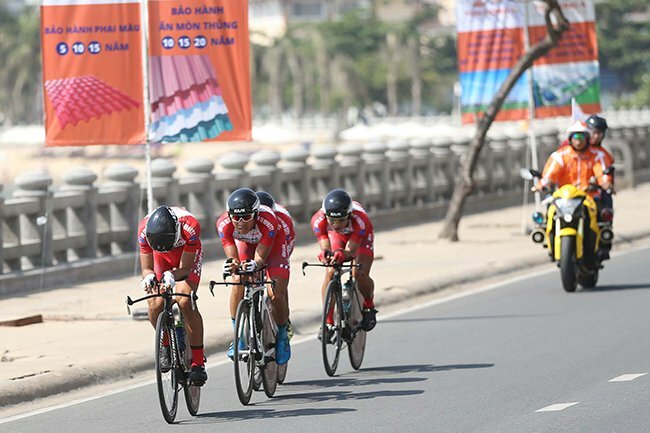 In addition to the presence of H’Hen Nie, the 17th team in the race at Nha Trang Racing Group also witnessed the fiery play of singer Thanh Hang. Back to the race, although only four drivers but VUS Ho Chi Minh City still excellently protect the first team, although in this competition An Giang Ngọc Trời is the winner. Also at this stage, the sponsor awarded 50 scholarships to poor pupils in Nha Trang City as well as awards to riders. And tomorrow, the delegation will have a day off in Nha Trang City before heading to stage 18 from Nha Trang to Phan Rang.